So, let’s say you discovered a wicked cool app or website or a bit of technology that suddenly makes Connected Learning and/or connecting with others a bit easier than before. Why keep that discovery to yourself? Why not share it out? That’s today’s Daily Connect concept. What is the single most important piece of technology that you have discovered that keeps you — or your students or your colleagues — connected? Now, find someone in your community (or communities) to share that idea with. We’d love it if you shared it here, too. Use the comment box on this post to add your ideas and links and thoughts. 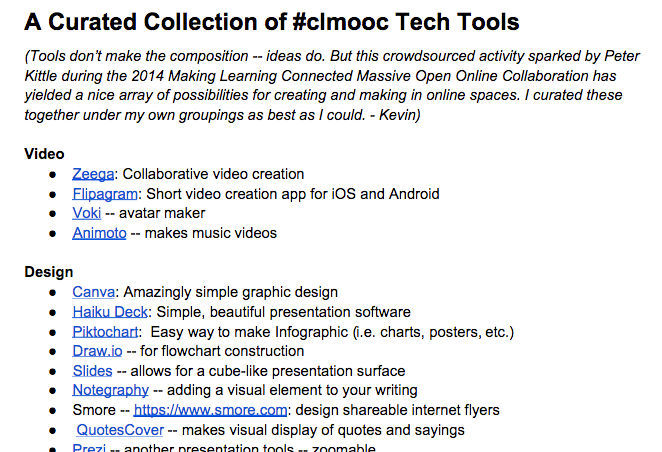 During the first Making Learning Connected MOOC, we crowdsourced a bunch of technology that we used for various Make Project Cycles. Feel free to steal the list and use it as your own. Idea submitted by Maha A. Beyond doubt, the most useful tool for connecting with others that I’ve used is Google Docs. PLEASE, everyone I work with and especially those who interact through conf calls, give it a try!